The first flight of a commercial airline was in a Benoist airboat piloted by Tony Jannus. This is part of a SPACE.com series of articles on the Greatest Moments in Flight, the breakthrough events that paved the way for human spaceflight and its next steps: asteroid mining and bases on the moon and Mars. On Jan. 1, 1914, the world's first scheduled passenger airline service took off, operating between St. Petersburg and Tampa, Fla. The St. Petersburg-Tampa Airboat Line was a short-lived endeavor — only four months — but it paved the way for today's daily transcontinental flights. The first flight's pilot was Tony Jannus, an experienced test pilot and barnstormer. The first paying passenger was Abram C. Pheil, former mayor of St. Petersburg. Their 21-mile (34-kilometer) flight across the bay to Tampa took 23 minutes. They flew in a "flying boat" designed by Thomas Benoist (pronounced ben-wah), an aviation entrepreneur from St. Louis. Percival Elliott Fansler, a Florida sales representative for a manufacturer of diesel engines for boats, became fascinated with Benoist's progress in designing aircraft that could take off and land in the water. The two men started corresponding, and eventually Fansler proposed "a real commercial line from somewhere to somewhere else." He proposed that the airline fly between St. Petersburg and Tampa. In 1913, a trip between the two cities, sitting on opposite sides of Tampa Bay, took two hours by steamship or from 4 to 12 hours by rail. Traveling by automobile around the bay took about 20 hours. A flight would take about 20 minutes. Fansler tried to interest Tampa officials in the venture, but they turned him down. He got a better reception in St. Petersburg, enticing several investors. Benoist arrived in St. Petersburg on Dec. 12, 1913, followed by his hand-picked pilot, Tony Jannus. Tony Jannus, pilot of the world's first airline. Jannus was already a popular figure in aviation. His dark, handsome looks and daring exploits made him the epitome of the romantic flyer. According to a biography by the Tony Jannus Distinguished Aviation Society, "once known as a fearless daredevil and admirer of women, running from angry fathers with pointed shotguns and dating movie stars, Jannus took risks in love and war." Jannus gave flying exhibitions, tested military planes, and flew long-distance airplanes and airboats. He piloted the first tests of airborne machine guns. On March 1, 1912, he carried Capt. Albert Berry aloft to make the first parachute jump from an airplane. By 1913, at 24, he had become one of the principal stockholders in the Benoist Aircraft Company. A Model 14 Benoist airboat was shipped to St. Petersburg by train. It weighed 1,250 lbs. (567 kilograms), was 26 feet (8 meters) long and had a wingspan of 44 feet (13 m). It was powered by a Roberts 6-cylinder, in-line, liquid-cooled, 75-horsepower engine. The airplane had a top speed of 64 mph (103 km/h). The hull was made of three layers of spruce with fabric between each layer. The wings were made of spruce spars with linen stretched over them. The plane was built to hold only a pilot and one passenger side-by-side on a single wooden seat. Percival Elliott Fansler, Abram C. Pheil, and Tony Jannus pose before the inaugural flight of the St. Petersburg-Tampa Airboat Line — the world's first airline. The first flight went off on New Year's Day, 1914, with much pomp and circumstance. About 3,000 people paraded from downtown St. Petersburg to the waterfront to watch as the first ticket was auctioned off. Pheil, then in the warehouse business, won with a bid of $400 (more than $8,500 in today’s dollars). Just before the flight, Fansler made a brief speech, saying, “What was impossible yesterday is an accomplishment today, while tomorrow heralds the unbelievable,” according to the Tampa Bay Times. After several more speeches and many photographs, Jannus and Pheil squeezed into the small wooden seat. As they took off, Jannus waved to the cheering crowd. He flew the plane no higher than 50 feet (15.2 m) over the water. Halfway to Tampa, the engine misfired, and he touched down in the bay, made adjustments and took off again. As the plane landed at the entrance of the Hillsborough River near downtown Tampa, Jannus and Pheil were swarmed by a cheering, clapping, and waving crowd of about 3,500. Pheil went about his business and placed an order of several thousand dollars for his wholesale company. At 11 a.m., Jannus and Pheil flew back to St. Petersburg. The entire trip had taken less than an hour and a half. The airline made two flights daily, six days a week. The regular fare was $5 per person (about $100 in today's dollars) and $5 per 100 pounds of freight. Tickets sold out for 16 weeks in advance. 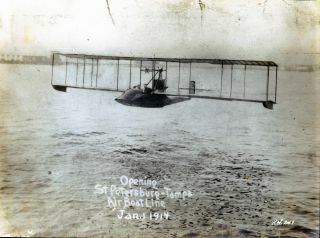 A second Benoist airboat was added, and flights were extended to Sarasota, Bradenton and Manatee. Tony Jannus' brother, Roger, was the second pilot. The airline operated for nearly four months, carrying a total of 1,205 passengers. Passenger interest declined rapidly when the winter residents began heading back north. On April 27, Tony and Roger Jannus flew their last flight before leaving Florida, putting on an air show over Tampa Bay. The brothers continued to give exhibitions, perform tests of aircraft, and train other pilots. On Oct. 12, 1916, Tony Jannus was training Russian pilots when his plane crashed into the Black Sea. His body was never recovered. Roger Jannus also died while flying. He crashed on Sept. 4, 1918, during air patrols over France. In 1964, the Tampa and St. Petersburg Chambers of Commerce established the Tony Jannus Distinguished Aviation Society in honor of Tony Jannus.